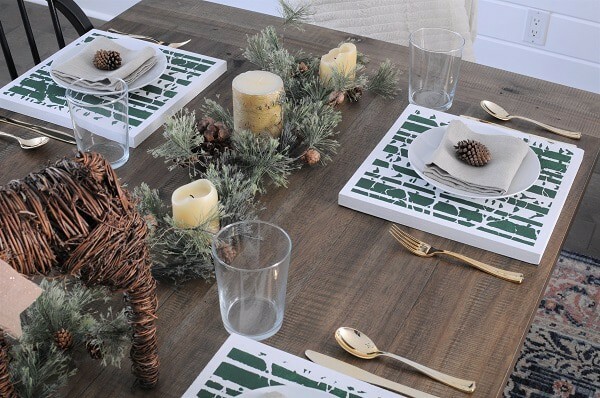 These beautiful DIY placemats are painted with a stylish stencil making them the perfect addition to a table setting. 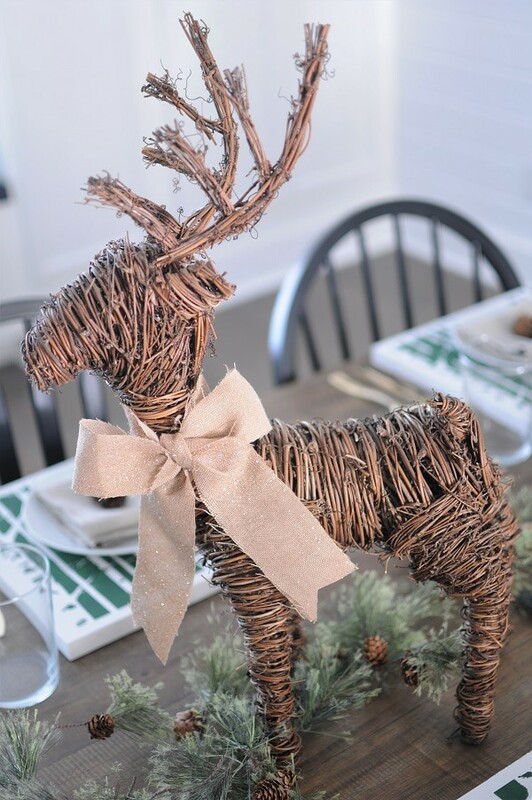 Follow these step-by-step instructions to easily make some for your next holiday table! This post is sponsored by Cutting Edge Stencils. As always, the opinions are all my own. In case you haven’t caught on yet, I’m a huge fan of hosting. I LOVE having people in my home, especially for nicely set meals! 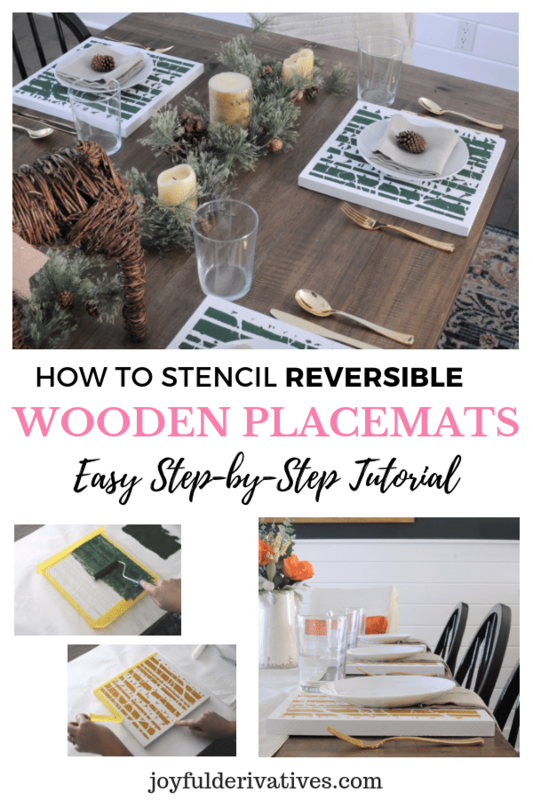 Thus, for my most recent DIY project, I thought it would be fun to create some custom, reversible wooden placemats to use for setting my table throughout the holiday season. 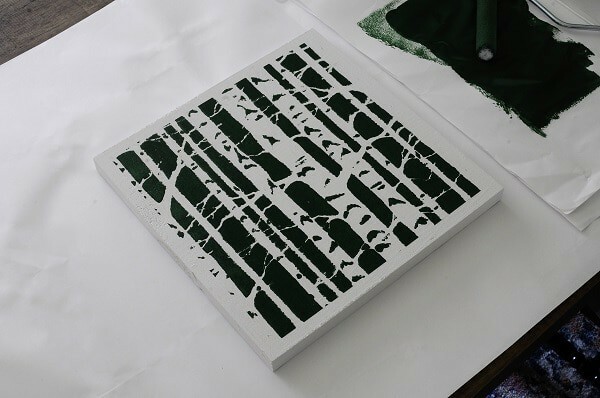 I chose to stencil them with the Birch Forest stencil from Cutting Edge Stencils (the same company that made the stencil I used on my bathroom floor) and just love how they turned out! By painting them different colors on either side, I was able to make them extremely versatile when it comes to matching whatever holiday table theme I decide to go with. 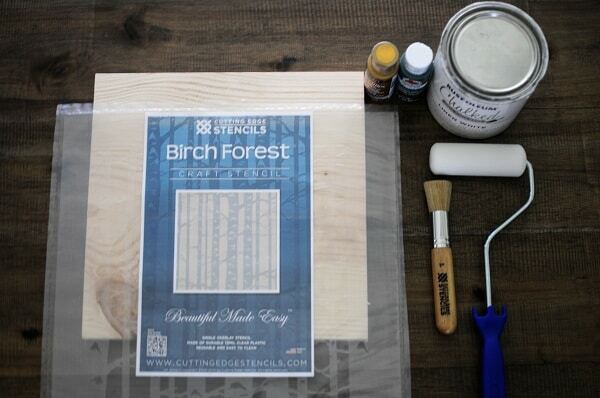 I chose the birch stencil because I know my decor tends to be a bit rustic, but since these are custom made, you can choose ANY of the amazing craft stencils available from Cutting Edge Stencils to match your style! For a modern looks, try their Lexington stencil or the Checks stencil! I love their Bricks stencil and Vision stencil too. There’s seriously a ton to choose from, you’re bound to find one you love! So be sure to head over to Cutting Edge Stencils and select a craft stencil (mine is size medium) to use for your DIY placemats! Please note: Some of the links in this post are affiliate links, which allows me to make a small commission from your purchase, but your purchase price stays the same. Thank you for helping support my blog! I greatly appreciate it! 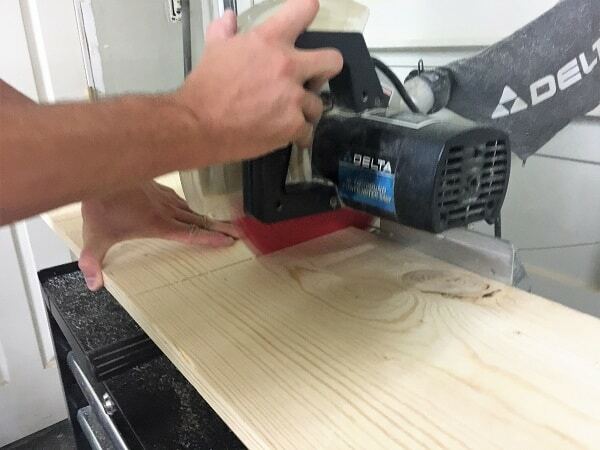 Begin by using a chop saw to cut your 8′ board into 6 square placemats. 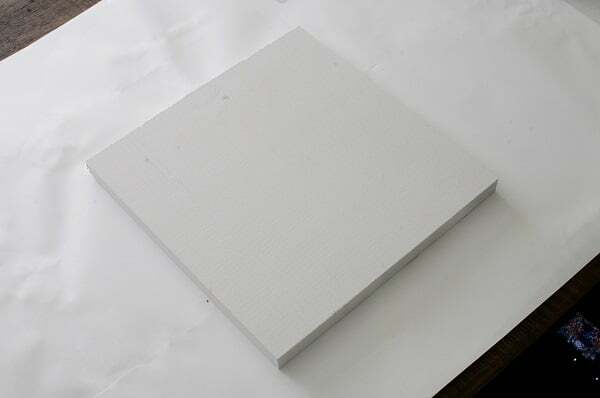 The 1×12 common boards are actually only about 11.5″ wide, so you should end up with 11.5″ square placemats. 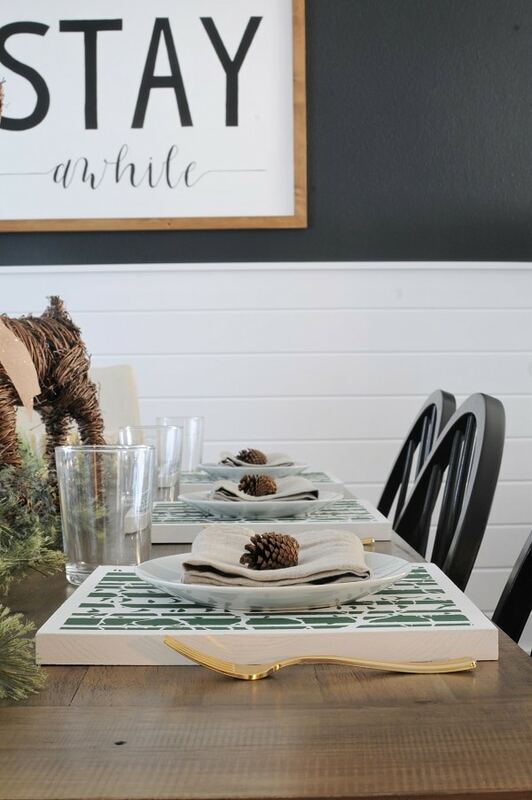 Next, use a 4″ roller with a 1/4″ nap pad to paint your entire placemats white with chalk paint. I liked that after one coat of white you could still see the wood grain a bit, so I left it with just one coat. If you prefer a more solid white, apply a second coat! 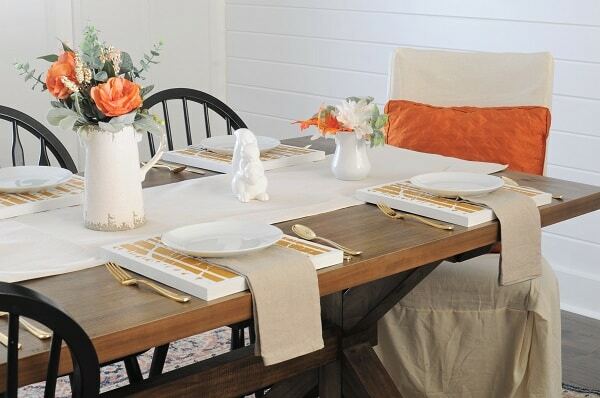 In order to keep a white border around the edges of your placemats, you need to tape off the edge with painter’s tape. 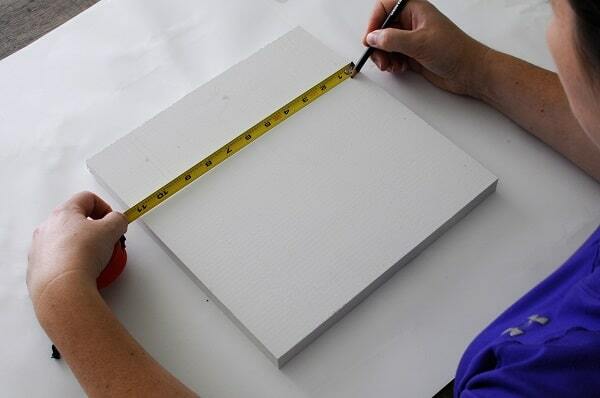 Start by measuring and marking with a pencil 1/2″ from the edge on all edges and both sides of all the placemats. 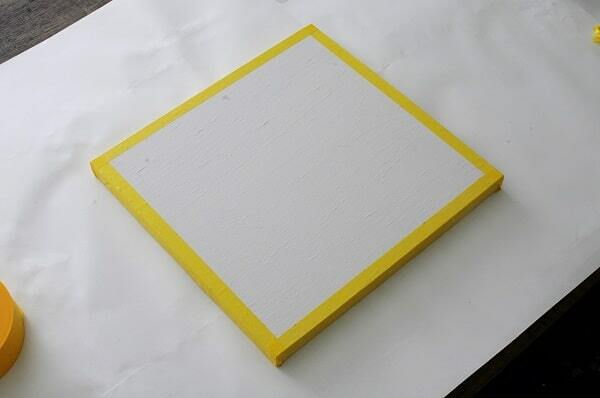 Next, on just one side of the placemat, apply tape around all four edges along your 1/2″ marks. 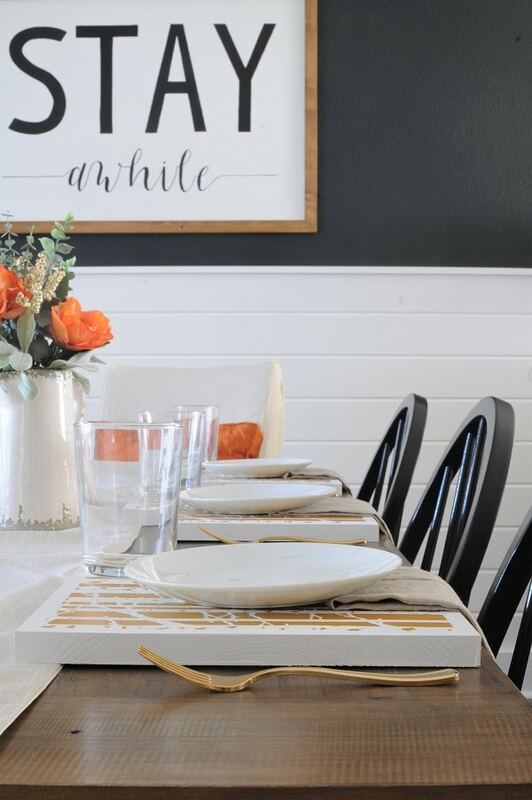 You should now have 6 placemats painted white on all sides, with 1/2″ border marked on both faces and one face prepped for stenciling. The next few steps will need to done on each of the placemats individually. 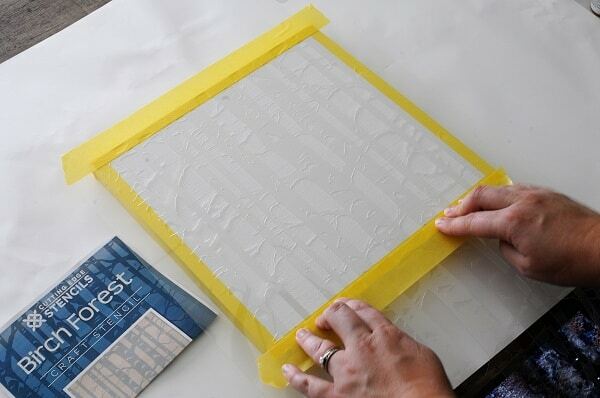 Now that you’ve prepped the placemats for stenciling, it’s time to place and prep your stencil! 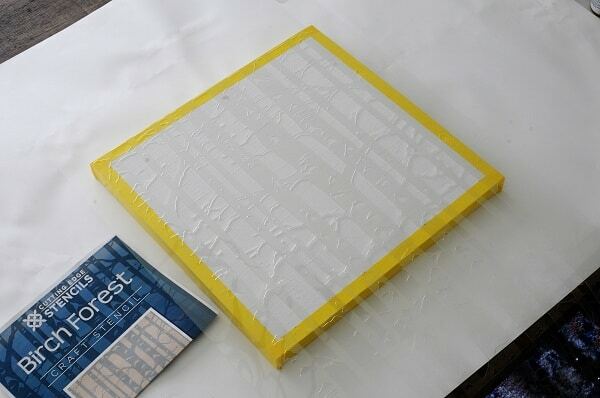 Place your stencil on top of the placemat with the top edge of the stencil design at the top edge of your placemat. 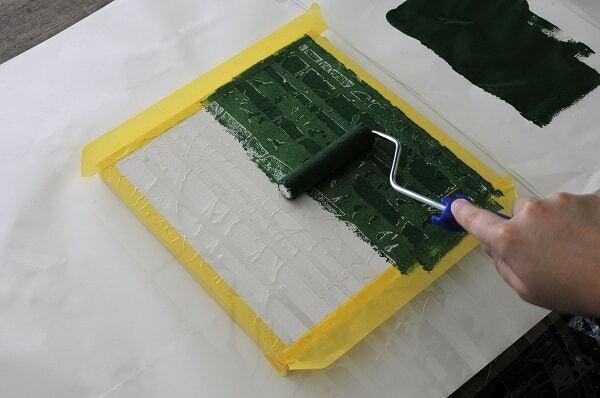 Doing this allows you to use the straight edge of your stencil pattern to square up to the placemat. 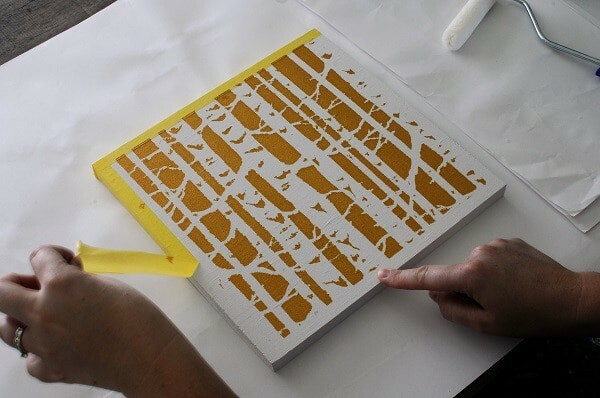 Now, apply painters tape to the top and bottom in order to hold the stencil in place. 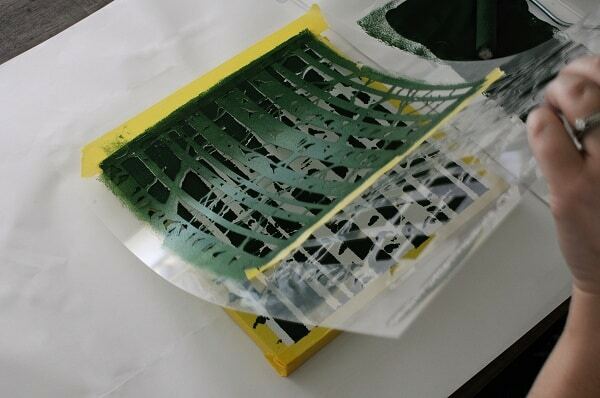 The tape should be on top of the stencil and even with your tape for the border. Press it in place between the stencil pattern so the stencil doesn’t shift during painting. 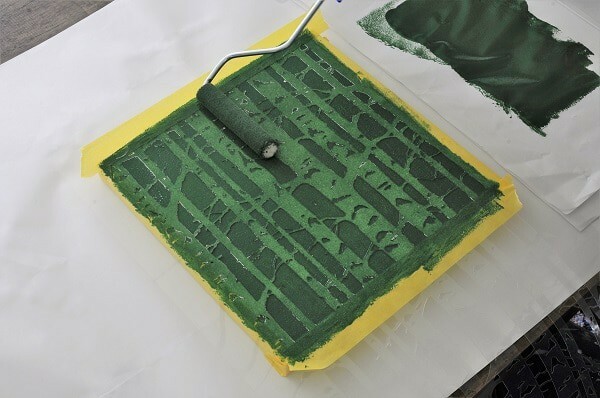 Using your 4″ roller and a new 1/4″ pad, paint over your stencil with one of your colored acrylic paints. Be sure you have an even amount of paint on your roller (but not too much!) in order to get a nice coat. I rolled a light coat on mine both vertically and then horizontally. 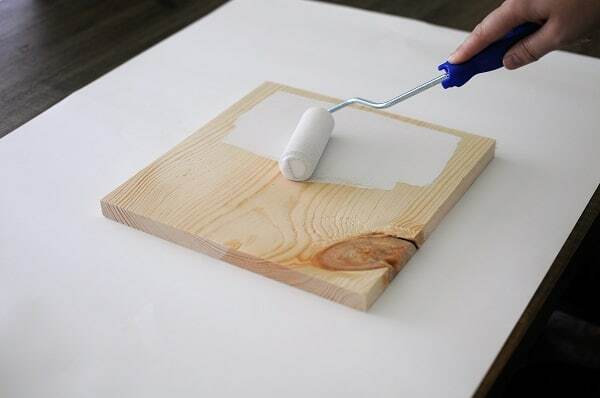 After you have what looks like an adequate coat of paint, gently pull the stencil straight up and off the placemat. 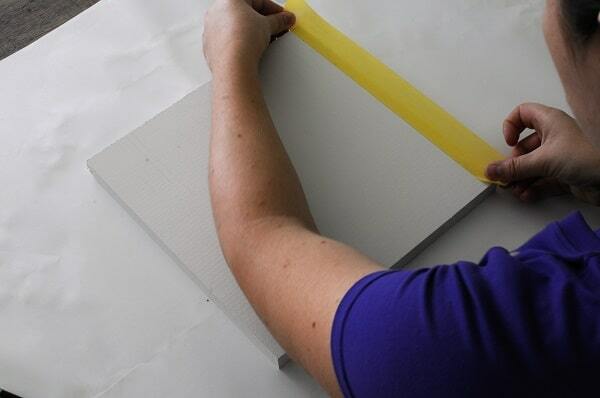 Carefully remove the painter’s tape from the edges while the paint is still wet and set aside to allow it to dry. 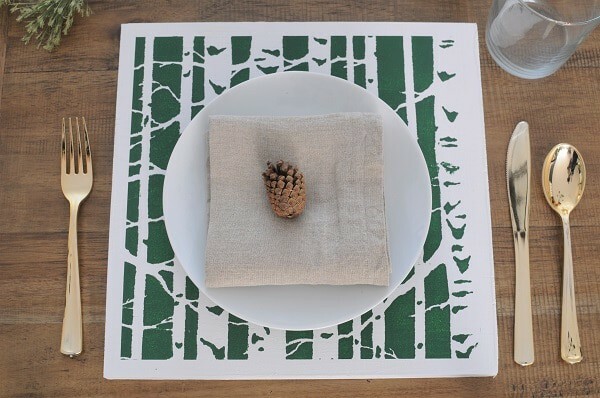 You don’t need to wash the stencil between placemats, simply place the stencil on your next placemat and paint away! 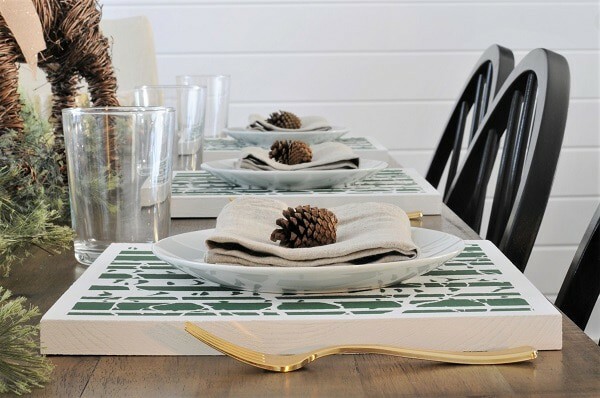 Do this until all 6 DIY placemats have the stencil painted on one side with your first color. Repeat steps 3-5 on the second side of each placemat – tape the edges, tape on the stencil, paint, remove the stencil and the painters tape from the edges and allow to dry. And that’s it! 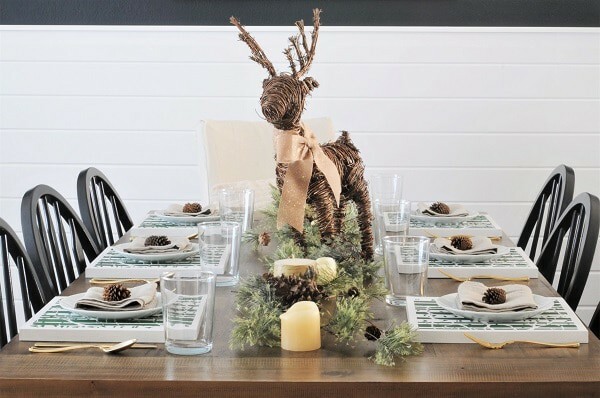 You now have your very own DIY placemats that can be used throughout the holiday season with just about any holiday table theme you decide to go with. The options are endless with this tutorial… think of all the color and stencil combinations available! Don’t they look awesome?! I seriously love them. 🙂 Can’t wait to set my Thanksgiving table with them! 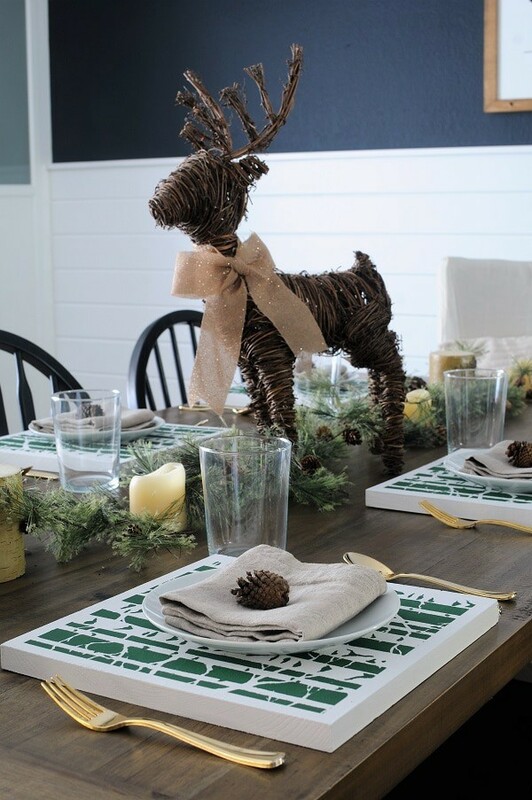 Be sure to head over to Cutting Edge Stencils to check out their vast array of stencil options – you’re bound to find one perfect for you home this holiday season! Hi there - it's nice to meet you! 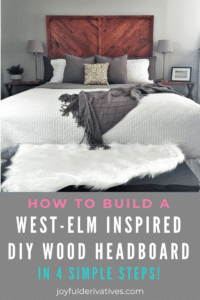 I'm Rachel Joy - a DIY addict obsessed with all things home. 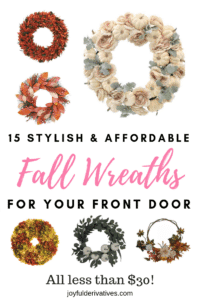 Through this blog, I inspire and teach non-designers simple and affordable ways to create a home they love spending time in and are proud to share with others. I am so glad you are here! Won't you stay awhile?